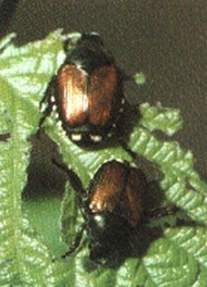 The Japanese beetle, Popillia japonica, is considered the single most important turfgrass-infesting pest in the United States. It was first discovered in the U.S. in southern New Jersey in 1916. 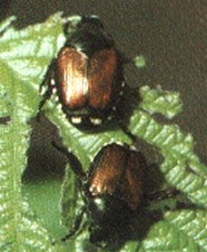 Japanese beetles occur in every state east of the Mississippi River except Florida. The insect’s spread is apparently governed by temperature and precipitation. The beetle is adapted to a region where the mean summer soil temperature is between 64 and 82F and winter soil temperatures are above 15F. Also, beetles thrive in areas where precipitation is rather uniform throughout the year, averaging at least 10 inches during the summer. Life Cycle: Japanese beetles have only one generation per year. In mid-June or around 1000 growing degree day units, adults begin emerging from the soil. Immediately thereafter, females mate with males and begin laying eggs. Adult beetles are most active in the afternoon in full-sun. Females leave ornamental plants where they feed and mate, and burrow two to four inches into the soil (under the turf and in mulched areas) in a suitable area to lay their eggs. Eggs hatch in about two weeks, after which grubs begin feeding on the roots of turfgrass and ornamental plants. The grubs grow quickly, and by late-August are nearly full-grown (about one inch long). Mid-summer rainfall and adequate soil moisture are needed to prevent eggs and newly-hatched grubs from drying out. Adult females instinctively lay their eggs in areas with higher soil moisture content to ensure survival of their offspring. 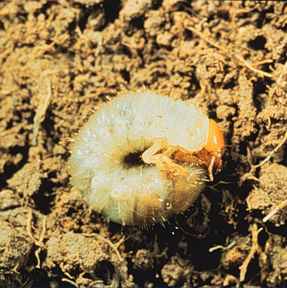 Older grubs are more drought-tolerant and will move deeper into the soil if conditions become dry. 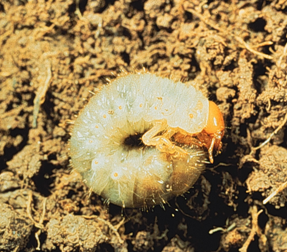 Grubs can also withstand high levels of soil moisture, so excessive rainfall or irrigation will not affect them. As soil temperatures cool in the fall, and the first meaningful frost occurs, grubs begin to move deeper into the soil. Grubs overwinter in the soil about two to six inches below the surface, although some may be a deep as 20 inches. They become inactive when soil temperatures fall below 50F. In the spring, when soil temperatures reach 50F, the grubs begin to move up into the root-zone to resume feeding for about three to five weeks. Thereafter, the grubs stop feeding and begin creating an earthen cell where they pupate (i.e., transform) into adults.